Antifreeze contains ethylene glycol, an organic compound that can cause ethylene glycol poisoning. It’s a potentially fatal condition that is caused when one ingests the compound, and pets are often exposed to antifreeze in a variety of different ways. For instance, your car may leak antifreeze from the engine to the ground or it could be spilt when you’re pouring it into your car engine. The container may also be loose or leak antifreeze down the side when you put the cap back on, and this will be exposed to your pets. It’s one of the most common forms of poisoning in pets. If your pet does ingest antifreeze then it’s important they receive immediate care. However, prevention is always the best way to deal with something like antifreeze, and we’ll be talking about it in this article as well as some emergency tips. In most cases, you’ll start to see symptoms within 30 minutes to 12 hours of your pet ingesting antifreeze. Some symptoms can also develop 2 to 3 days after ingestion. It’s important that you recognize the bright green color of antifreeze and the sweet smell that comes from it. Small amounts are toxic to the body when ingested, so if you notice any of the bright green liquid around your garage or car, make sure you clean it up before your pets are attracted by the smell. The best method to avoid antifreeze poisoning in your pets is to take preventive measures. Always keep antifreeze bottles out of reach from your pets. This includes locking them in cabinets and not placing them on open shelves. When using antifreeze, make sure your pet is away from your car so they won’t smell or become curious about the antifreeze. Make sure you seal the antifreeze bottle tightly when you’re finished using it. Wipe up and clean any antifreeze that may have leaked when you placed the fluid in your engine. If you do spill the antifreeze, keep your pet far away from it as you clean it. Check your car frequently after using antifreeze to ensure that it isn’t leaking out of your engine and out underneath your car. Purchase antifreeze that contains propylene glycol as an active ingredient. This is less toxic and doesn’t have a sweet smell or taste. If you suspect your pet has ingested antifreeze or any other toxic substance, please call us immediately at (651) 484-3331. What’s the first thing you think of when mentioning the word “February”? Did the thought of hearts, chocolates and candy-grams that make a special appearance this month jump to the forefront of your mind? It is the month of Valentine’s Day, and with the extra opportunity for treats and decorations, we wanted to share four Valentine’s Day hazards to be mindful of in keeping your pets safe during this sweet holiday! A sugar substitute that is found in many candies and gums, xylitol is highly toxic to dogs, even in the smallest of amounts. Be sure to keep any of these items up out of reach of your curious canine. If your pet ingests any items containing xylitol, it’s imperative that you call us immediately. When xylitol poisoning is recognized early, treatment is possible and increases the likelihood of a better outcome for your dog. It’s fairly well known that chocolate can present dangers to our dogs, and is potentially fatal. However, certain types of chocolate are more hazardous than others - typically the darker the chocolate, the greater the risk. Keep all chocolates far out of reach of your pets, and especially items such as cocoa, baker’s chocolate, and dark chocolate. If you’re unsure of whether or not to seek veterinary attention, please give us a call. In addition to chocolate, there may be other items ingested which may be causing problems for your pet. As beautiful as they are, floral arrangements can be toxic to our four-legged friends. Lilies, tulips, azaleas, and Sago Palm are extremely hazardous, and can cause vomiting, kidney failure, and even death. If you receive an arrangement with any of these species, be sure to put them far out of reach from pets, and instead in a place where you can enjoy without worry of the flowers presenting a danger. Everyone loves to get gifts, and once the treasure is unwrapped, the ribbon, bag, or wrapping is often cast aside. Your pets may be tempted to play with these items, or even to ingest them. Not only can this present a choking hazard, but also creates an opportunity for an intestinal blockage or other complications. Having snacks along with a quiet movie night? Be sure to keep the chip or other snack bag out of your pet’s reach. 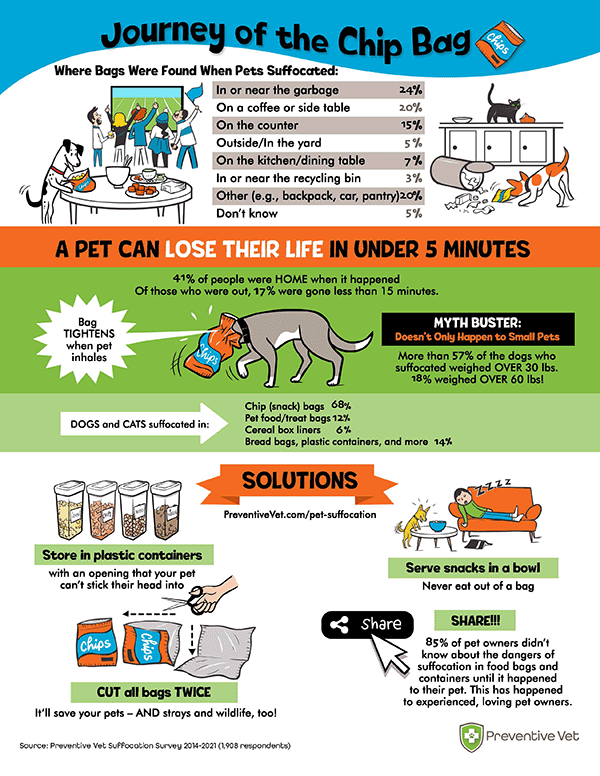 Pet suffocation can occur in less than five minutes. This infographic shows how quickly and often this accident occurs. We know you love your pet, and since this is a holiday celebrating love, be sure to spend some extra time with him or her. Giving the furry, feathered or scaled pets in our lives a little extra love is just what our doctors ordered! The obesity epidemic in the United States is reaching epidemic proportions in both pets and people. Whether in part to our long and cold winters or intentional neglect, pet obesity is a tremendous problem. One easy way to combat this issue is to hit the pavement with your dog at least 30 minutes each day. Here are a few important considerations as you commit to better health for your pet! To avoid an accident or a cold-related illness, you’ll want to pay attention to seasonal safety. This begins with your dog's paws. Even though he may protest, consider covering them with dog boots to protect against the chill caused by ice and snow. If you go without booties, be sure to trim extra fur between your dog's toes. This stops ice from sticking to his toes. Our online store features a Dermoscent Bio Balm which helps keep your dog’s feet protected when used before and after a daily walk. It is important to pay attention to the signals your dog sends that she's in danger of developing frostbite or hypothermia. Some of these including quicker panting, whining, anxiety, discomfort of lifting of paws, disorientation, or sitting down while on the walk. If any of these occur, head home at once. Dogs who do not get necessary daily exercise can develop problem behaviors such as excess chewing or destruction of household objects, eliminating in the house, separation anxiety, or aggressiveness. Before getting frustrated with your dog, think about if he's getting enough regular exercise. Daily outings together increases the chance for social interaction with other dogs and people. Walking improves your dog's confidence since it exposes them to a wide range of people, places, situations, and weather conditions. This gives you a chance to practice training and simple commands. Of course, the added benefit of having the opportunity to get your undivided attention is what your pet wants most of all! A Daily Walk is Good for YOU, Too! No matter what the weather conditions, a brisk half-hour walk daily helps lower the risk of heart attack, stroke, diabetes, cancer, and Seasonal Affective Disorder in humans. January may be chilly, but it's also National Walk Your Dog Month. If you do not normally take your dog for a walk every day, the flipping of the calendar to 2019 is the best opportunity to make a new habit. The next time you're tempted to skip your dog's daily walk, think about the important benefits your pet will miss: It's not exactly warm and sunny this time of year, yet your dog still wants all of the benefits he receives from a daily walk. As always, please contact Grantsburg Animal Hospital at (800) 924-0588, if we can be of further assistance.